A carefully crafted patio really is the heart of the garden, a place to sit, relax, dine and enjoy those lazy summer days. 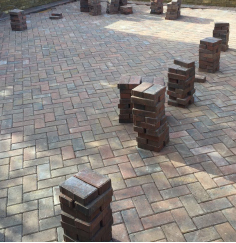 With many years of experience under our belts, we can truly build the perfect patio for you. 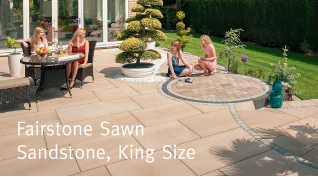 With such an exciting range of natural stone, man-made and reclaimed products easily available and at surprisingly affordable prices, Able Landscaping are best placed to assist you in designing an outdoor space to suit your taste and budget and provide you with many years of enjoyment. You'll see just a few images from our extensive portfolio on this page, but remember, these are only a few examples of our work. We keep an extensive portfolio that you can view on request and we always have brochures from our chosen suppliers available to help you decide on the perfect product. 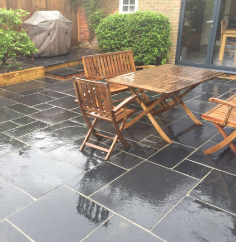 If you would like to find out more about our Patio services please get in touch. As part of the quoting process, we are proud to offer a free CAD design service, offering you are properly designed, accurate scaled drawing which will assist no end in visualising the finished result. Remember, our work is fully guaranteed and we are regularly assessed by our Marshalls Regional Assessor, so you can relax, safe in the knowledge that you are in good hands. 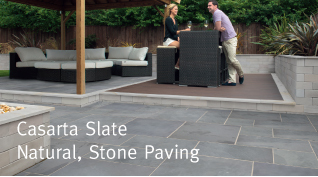 No patio is too big or small for us, whatever your space, we're positive we can create a patio solution for you. We can advise on the best materials to use to either compliment your home, or create a unique addition. Brickweave patios; modern and most popular - integrating a mixture of colours and generating unique patterns. 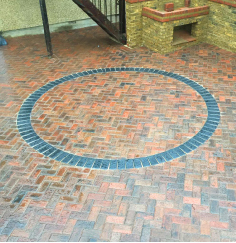 Courtyard solutions; if you want a more traditional look. 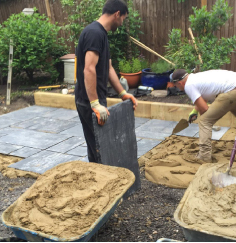 Garden paving (larger slabs); durable man-made slabs. Beta setts; ultra smooth surface ideal for wheelchair users or if you want an area for bikes etc. 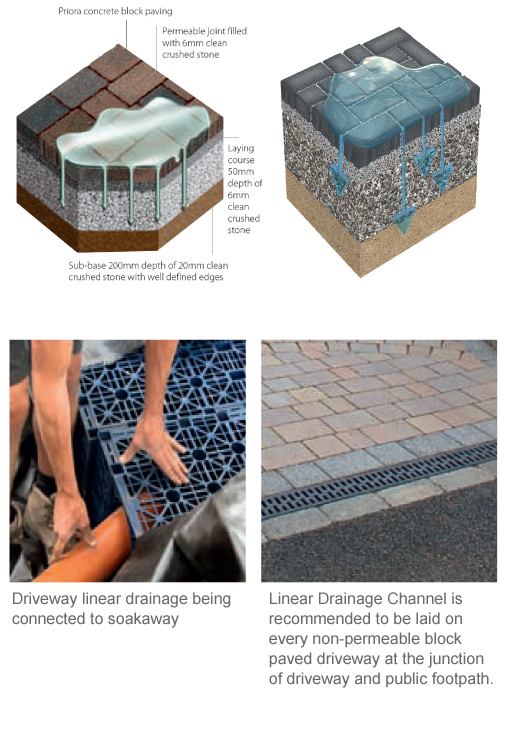 The main reason behind making planning permission a must have, is due to ensuring that water run off is considered and methods are considered to prevent flooding to public roads and neighbouring houses. However, the rules around planning permission are quite complex - it can be dependant on the materials you choose and the style of your home, for example if you live in a listed building you will definitely need planning permission. 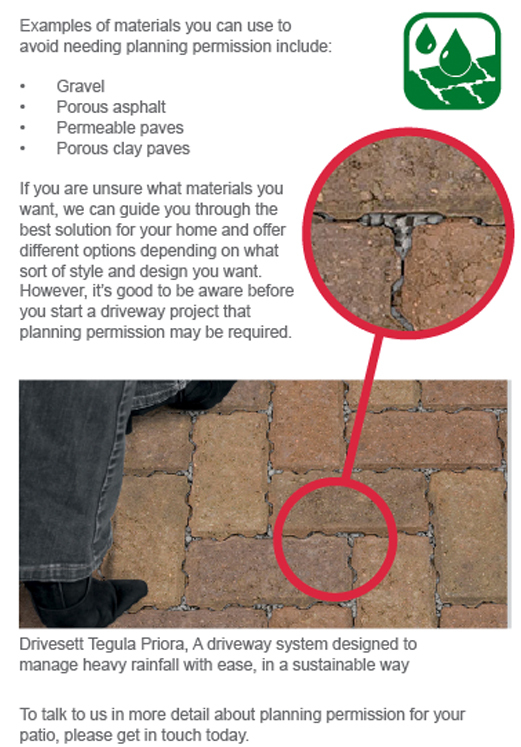 But if you don't live in a listed building and you choose certain materials for your driveway you can be exempt from needing permission. "Could not fault him. Our work was completed to a very high standard and we are very pleased with the results. 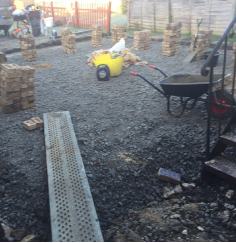 He was a very polite agreeable tradesman and he delivered our new garden to us within the budget agreed." 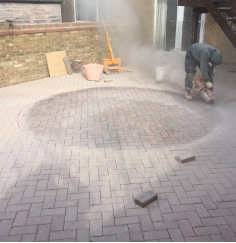 "We would like to say a big thank you to the team, for the excellent and professional workmanship you both did on the recent transformation of our rear garden into an excellent patio area. You were very courteous, hard working and very reliable, we would have no hesitation in recommending Guildford Landscapes"